If you love fruit fillings, this rhubarb-danish-pastry dessert is for you. 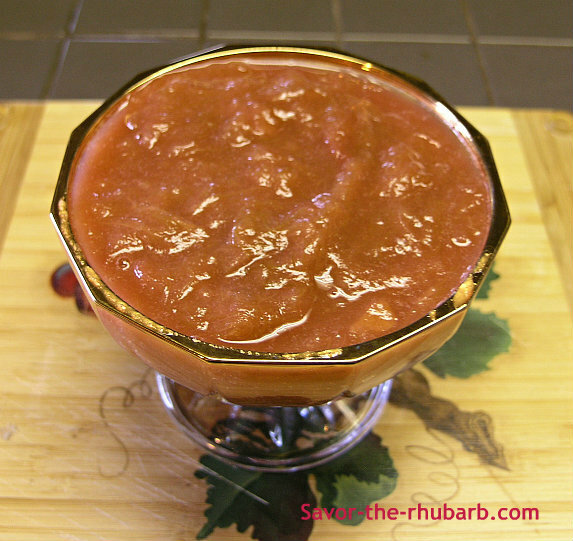 Make the sauce, make the dough in a short period of time and it just couldn't be easier. Are you attracted to the lemon and blueberry-filled pastries in the bakery section of the grocery stores? We sure are. It's all we can do to not pick up a package of those things when grocery shopping. So sickeningly sweet, gooey and delicious. My husband loves blueberry "anything" and so I've always wanted to make them myself. What had stopped me was the thought of taking hours to make a special pastry. A friend suggested cream cheese pastry, which proved to work well. It's very easy to make and done in 10 minutes. 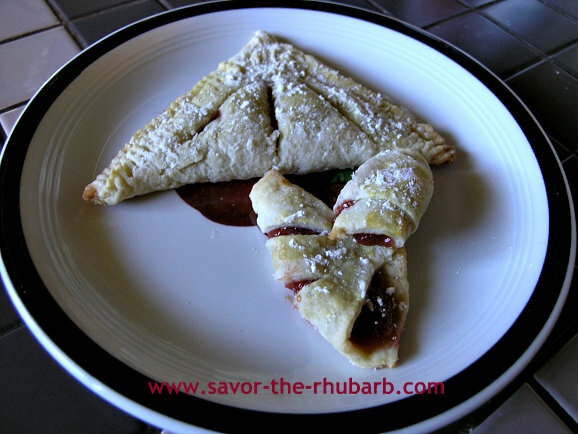 Why not make Rhubarb Filled Danish? 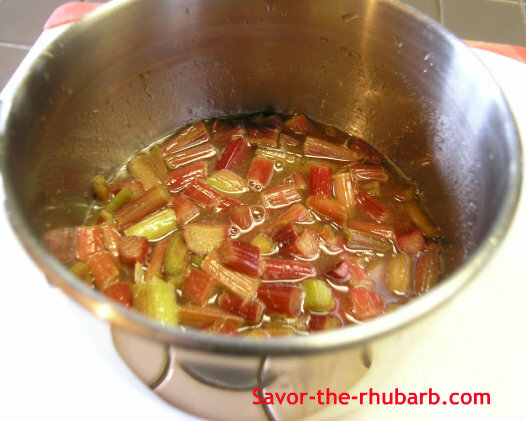 Before I got started, I took out 3 cups of frozen chopped rhubarb and made a compote or "sauce." I added to it some crystallized ginger pieces, (a tsp. of powdered ginger would be fine) 2 tablespoons of sugar and a quarter cup of orange juice. 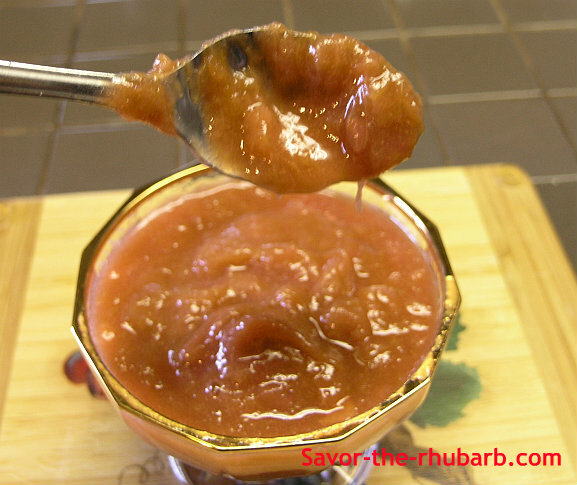 Stew it on low heat until rhubarb has fallen apart. This pastry consists of 3 ingredients only and all you have to remember is to have the butter and cream cheese softened "naturally" on your kitchen counter beforehand. 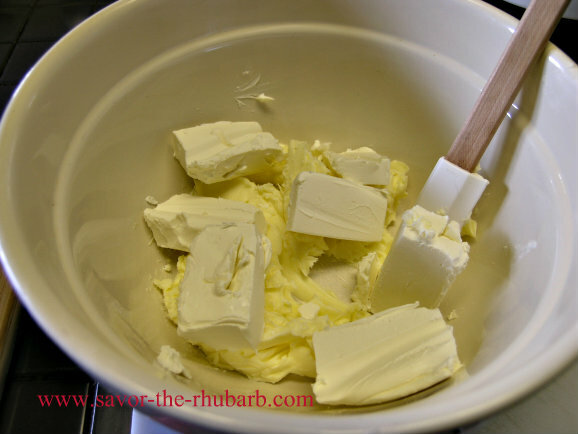 Combine almost a half pound of butter (or 3 sticks) with an 8 oz. package of plain white cream cheese. Mix well, and add in 3 cups of all-purpose flour. Stir with a fork until crumbly and then form into smaller balls of pastry. I found this much easier to work with later. 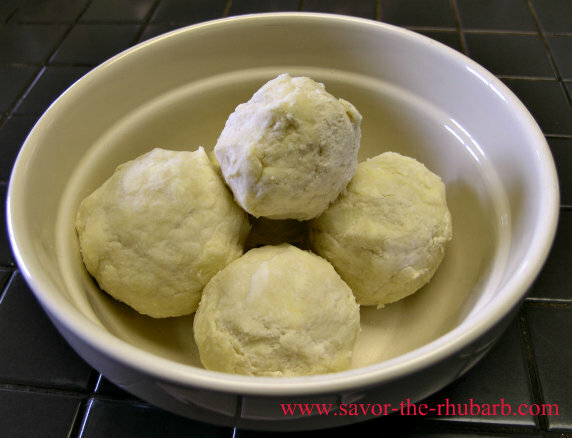 Chill the balls of pastry dough in the refrigerator for at least an hour before rolling out. After these have chilled, roll out on a board or counter-top that's been dusted with a bit of flour and white sugar. 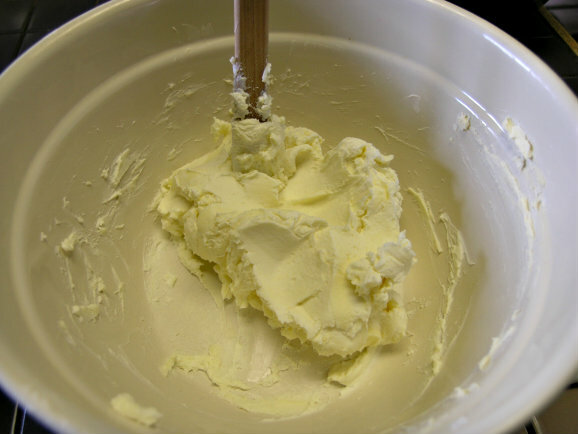 The white sugar helps to keep the dough from sticking to your rolling pin. I use an old wooden rolling pin that used to belong to my Mother and it works beautifully. 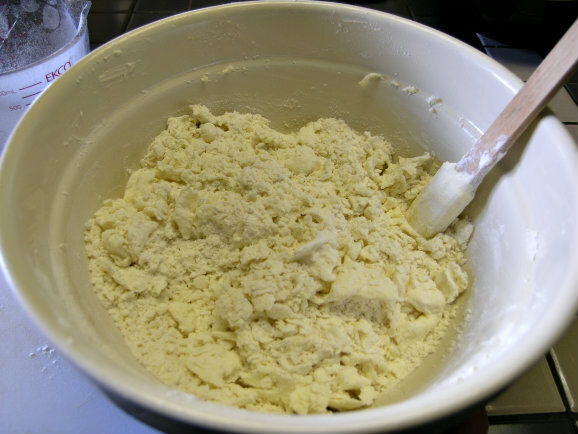 Dust it with flour as much as possible. Roll out your dough fairly thin; you'll get a feel for what is best to work with, and simply cut into large squares or triangles. 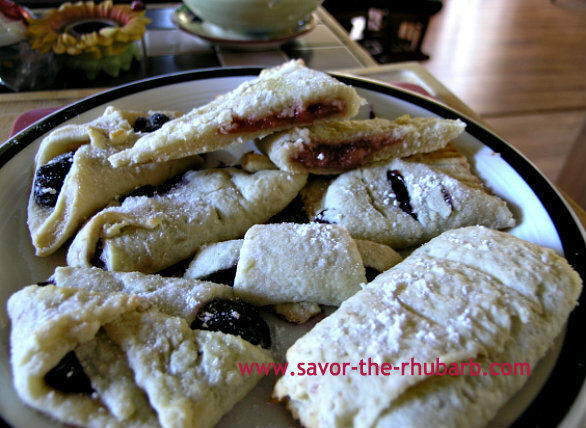 If you like pastries but don't have time to make the dough you can always opt for a more convenient method especially when it comes to making turnovers with rhubarb and other fruits of your choice. Cherries are good! This square is approximately 4 inches wide by 4 inches long. You can make them as big or as small as you wish. Fold over to the corners, and press with your thumb or a fork to seal. Make pricks with the fork to let steam out or small slices with the tip of a knife. 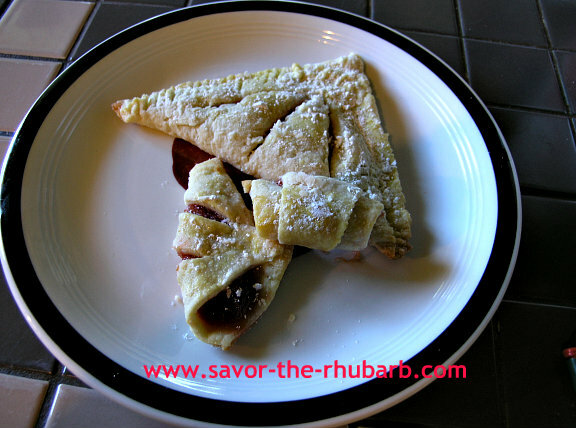 If you make your rhubarb-danish-pastry like a jelly roll, they can be cut. You can egg-wash them if you like or not. I sprinkled some with white sugar, and some with just icing sugar. I did NOT drizzle with white icing after baking. They are quite sweet as is. Place on a baking sheet (I used parchment paper) and bake at 350 F for 20 minutes, or until edges start turning brown. Remove, let cool and dust with icing sugar while still warm. And there you have it. 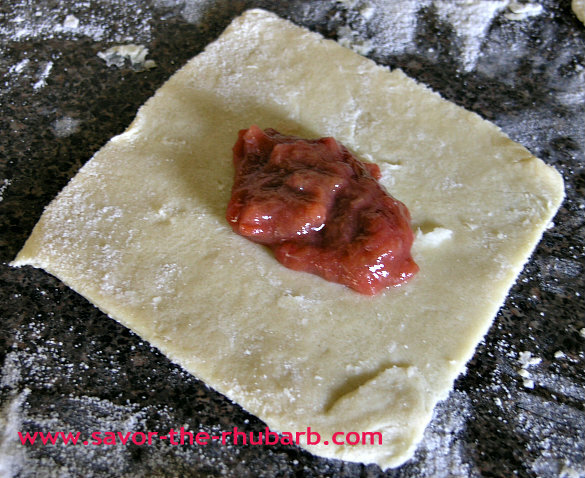 I must confess, I'm no pastry chef and haven't quite mastered the look of this filled rhubarb-danish-pastry yet. They may not be pretty, but they look better than the last batch, so I'm getting there. They don't last long here, so at least I know they are quite edible!